It was a nothing-to-do type morning for me. The previous day , I had quit my last job, and was not very keen on taking up the offer I had in hand. I actually was feeling “jobless”. But then I knew that there was not much to be done. I had to join the new company the next day. So I thought that I will just chill out at home for a day. Fortunately my PC also decided to give me a break, it simply refused to start.. Probably GOD wanted me to be completely away from the PC for the day or more… and then in a few minutes I get a call from a consultant, where I would like to go for an interview. Well .. I was all set. The interview was setup at 11:30am. I reached there well in advance ,but had to wait for sometime. The whole thing was done in less than 30 min including getting the Offer Letter. I had a week for joining. Lots of ideas were flowing in the mean while . I quickly called up my sister, who was to leave for Goa in the afternoon train. She was to reach home by 12:30 so that I could drop her off to the station on time. I told her about my brainwave to drive down to Goa. She was all excited. First of all she had already planned for the trip to Goa and had her leaves approved, and I was now free for a week or so. I told her to pack some stuff for the road trip. I knew that I cannot do the entire journey in the afternoon only and had to break the journey. I called up KPK, [ Pramod Kamath ] , who has just moved into his new apartment in Managalore. He was also keen to show me his brand new apartment. He was all excited about the whole thing and informed me that he will be at home.. Well that took care of the accommodation.. Not that it is difficult to find a hotel in managalore, but being with a friend and roommate for four years during college life , is something better and different. I reached home as soon as possible. Filled up Gas on the way, and by 2:30 pm we were all set to leave from home. Now, we come to know what it is to drive in Bangalore at noon. It took me an hour to reach the yeswantpur junction from my house[on Airport Road]. 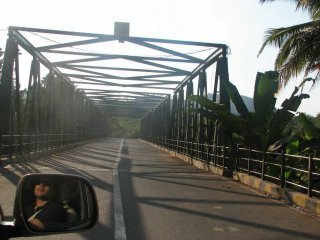 By the time I reached the Nelamangala diversion, it was 4 pm. Which means that I had only 2.5 hours of daylight to drive.. I wanted to cross the Sakleshpur Ghats before sunset. Well it was a nice drive. 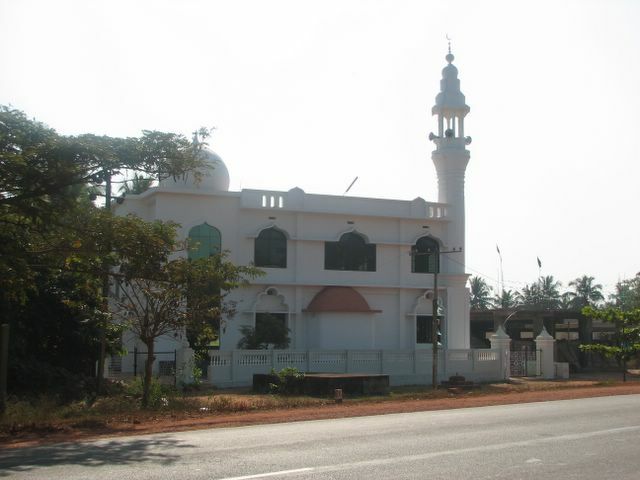 We took the first break at our traditional “Kamat Upchar” before Hassan. The Dosas and the Tea was refreshing. I recommend this place for the much needed break while travelling. They are really done well. The Gas Station is also very neatly maintained. Just as we moved out of this REST AREA, we see a pile up of Vehicles. I thought that there must be an accident. But luckily NO, it was just that the folks are on a Tree Cutting spree on the sides of the Highway, and the fallen Tree had now blocked the road.. That took an hours time to clear. And consequently we lost a full one hour of day light, waiting out there. We finally moved from that place at 7 pm. 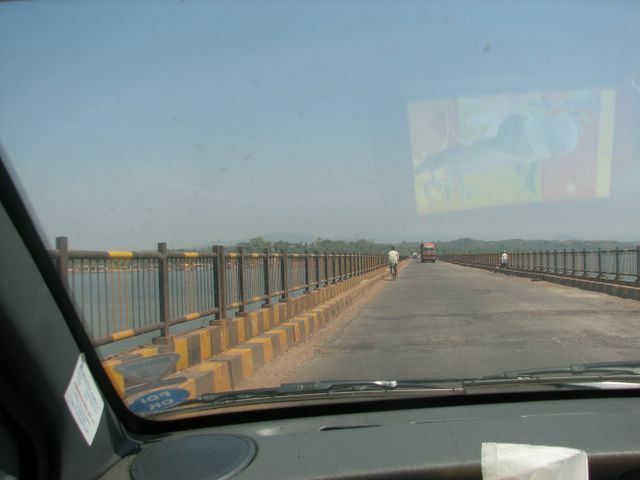 And then it was all the Ghats and criss cross roads. But there was one thing I learnt and liked in the bargain. It is much easier to overtake vehicles at night , rather than at day, as we can see the Headlights of the oncoming vehicle from a great distance. But yes, there is a small amount of the other risk, which is not able to see the entire road at night. 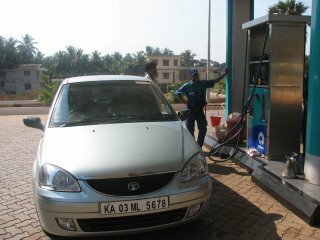 The next day we started at 9 from Mangalore. We decided that we will go in relaxed manner. We stopped at many places for pictures and moved on. The stop at Marvante was the one which I loved the most. It really made me nostalgic. 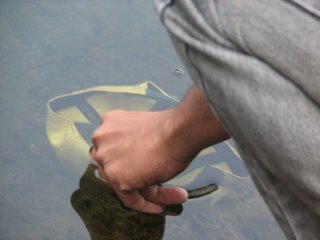 It reminded me of our first trip in Manipal. We had come to Marvante and stayed over at Turtle Bay… Well cool were those days. 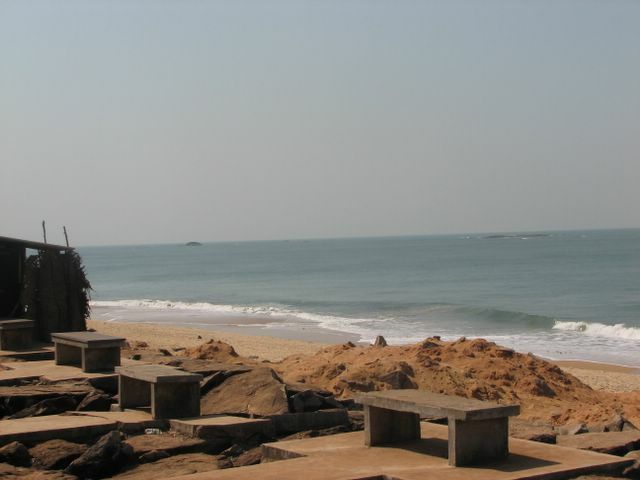 Here you can enjoy the true beauty of Marvante Beach. 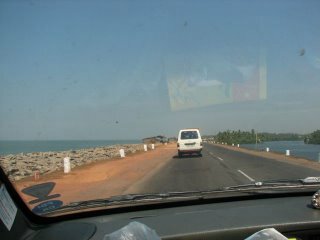 Its the National Highway which divides the Sea and the River... Beautiful Sight .. The traffic till the Kundapur was heavy, after that it was very peaceful. I then took over the navigator seat and Shweta Started to Drive. The entire stretch reminded me of many trips that we had made over the years. 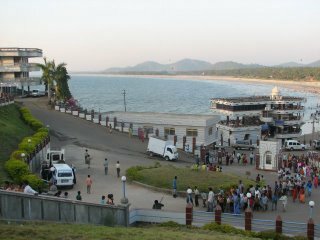 Once we reached near Murdeshwar, we thought that we will stop over there. But then decided against it , as it would take a longer time to reach home. And also we were starting to feel hungry and we didn’t want to have lunch at any place. Mom had told us that nice prawns are waiting for us for lunch. 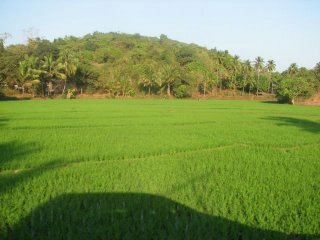 Again the stop at Ankola, near my mom’s college and then at Karwar made us feel at home. This is where my mom did her Graduation. 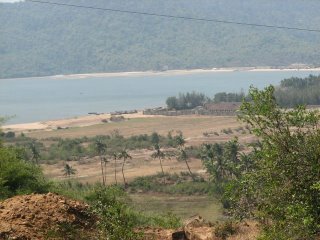 Just before approaching Karwar, we stopped to see the beautiful view of the Mudga Beach. Well this beach has its own significance, and due to its very nature, the Navy has decided to set up its base here. This beach has the unique distinction of NOT having any waves. It is a very very low energy beach. Well I never knew this, till I was told in my Geology class. 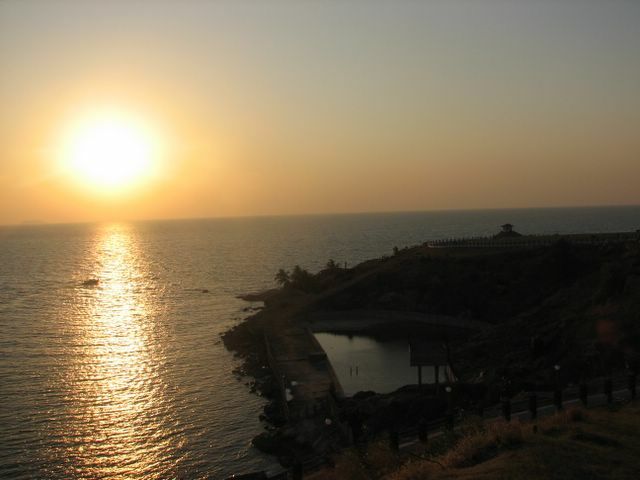 Hence "Sea Bird" project of the Indian Navy is setup here. 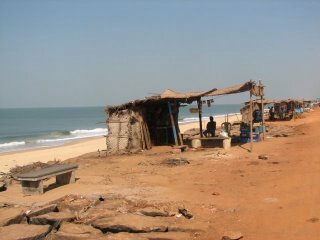 I had been to this beach many many times, as my grandfather's fields are just adjacent to this beach.Yes , this is my mother's place and have spent most of my summer vacations in this place. Now after the "Sea Bird " Project has started we are not even allowed to go that side... what a sad feeling. But yes, it is good for the Indian Navy. Here are some pictures of the Beach. 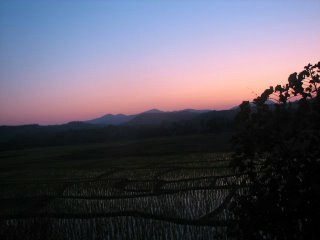 It is a very picturesque view. 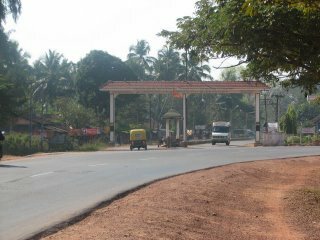 Do stop over here, if you are travelling this side. Finally at 3:30 pm we reached home. The Rice , curry and fried prawns never tasted to good anytime before. After having a delicious lunch , ie at 3:45 pm to be precise, I decided to relax a bit on the couch, watching the cricket match. I didnt even know when I had fallen asleep , and suddenly there was a flurry of wickets falling of the Pakistani side. I woke up with that. After a couple of minutes, I hear an Vehicle stopping infront of our house. I peep outside and there I see Mr Anup all shocked , surprised ... He had a question mark on his face as where has he seen this vehicle, with number 5678 and that too a Karnataka registered vehicle. He didnt have the slightest idea of my arrival and there he was at my place within half an hour of me reaching Goa. Well, what do we call this .. telepathy ??? His new Toyota Innova looked stunning. 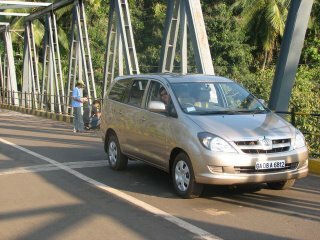 After giving the New Year compliments which he had got for my dad, we left to take our traditional drive to Colva. On the way he showed me a new Italian Ice-cream parlour, which was supossed to be the best in town now. 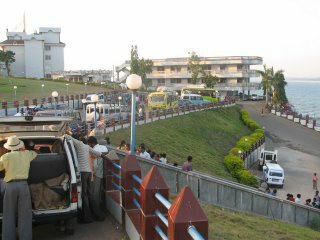 I didnt have the energy to get off the vehicle after reaching Colva. Also visited our favourite place, Sernaulim Beach. On the way back we stopped at the ice-cream parlour and had a cone . I dont remember the name of the flavour, but it was really good. They have two variants, one is the water based and one is the cream based. Obviously the "water based" is for those who are diet concious. Then I decided to test drive his new vehicle. Very very impresssive is all that I can say. It has got the right amount of stiffness and smoothness while driving. A very neat Gear Shift, and a very powerful AC. The power of the vehicle didnt come down even after switching on the AC. We then moved to Pravin Shop. He was waiting for Anup. My arrival was still a secret for him. He had told Anup that he will be at available for a short while. On seeing me in the car, his face suddenly changed and directly barged into the Innova. Needless to say , he was pleasantly surprised to see me. We again went for a drive and landed at the same Ice-cream parlour. It was now Pravin's turn to have the ice-cream. Well that was day 1. The next day I woke up late , good enough to see the Flag hoisting at the New Delhi by our President. It was nice to see the RD Parade and the Floats after a long time at home. It is a totally different feeling to see these programs at home, and even more better when you have no job tensions in your head. Every thing, including the live updates from Brig Sawant and Ms Komal Singh made the entire event very nostalgic. Anup's new Innova, on the way to the Lake. We stopped on this bridge to take some pictures. 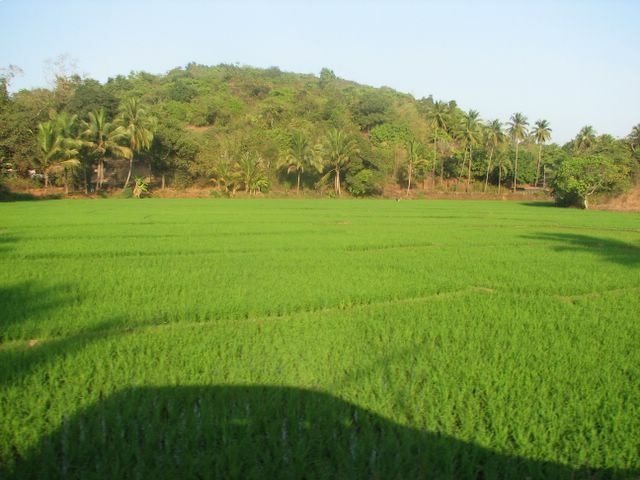 Lush Green Fields .. A delight for the eyes. 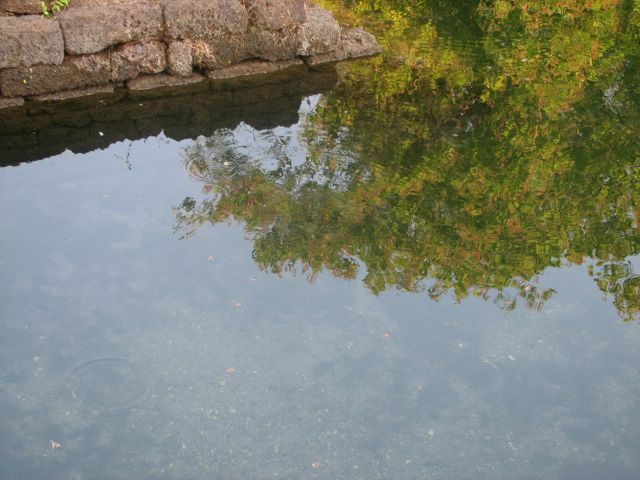 We finally reached the lake, only to find out that it is a small water tank near the temple. The beauty of this lake is that whenever there is a sound , bubbles start to emerge from the bottom of the lake. It looks really good and nice. I couldnt really take good pictures of this, but here are a few of them. New Methods of Fishing by Parag. The next day we had a function at home. It is called "Haldi-kumkum" Here you can see my mom giving the same to my sister. She had also come the same day from Silvassa. 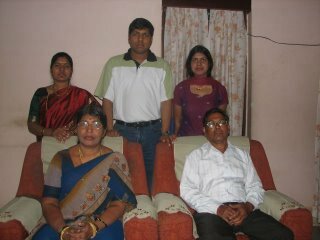 My Mom ,Dad and Sisters. Well another day was over. Next day we had to start back. In the morning we started to pack, rather to take to Bangalore what ever we would not end up taking due to excess luggage. Since we had a car at our disposal, we took everything that we thought was needed out there in Bangalore, and was lying unused at home.. 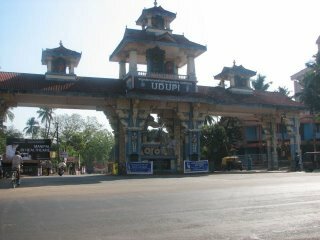 So at 2:30 pm on saturday we left for Udupi. Yes, we decided to stop over at Udupi and leave the next day to Bangalore from Udupi. That way we can break the journey and go in a relaxed manner. 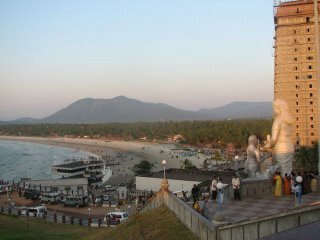 On the way to Udupi, we stopped over at Murdeshwar for an Hour. It is a well done place now. But to be frank, I liked it the last time I had come over here, ie probably 8 years back. Now there are new statues, lawns, and lots of other things. But it was too crowded. 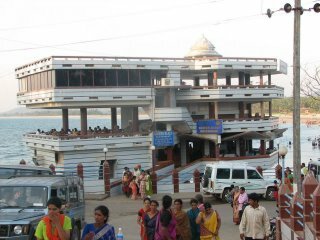 It had become more of a tourist place rather than a temple. 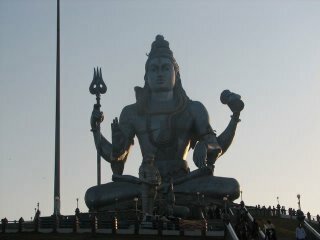 Here are a few pictures of Murdeshwar .. 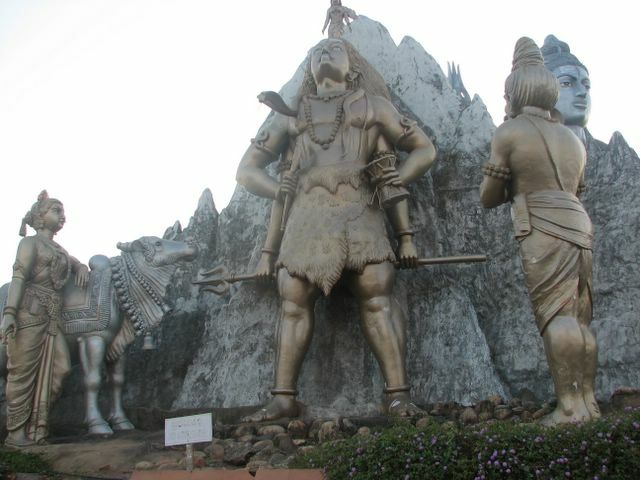 The Shankar Statue at Murdeshwar. 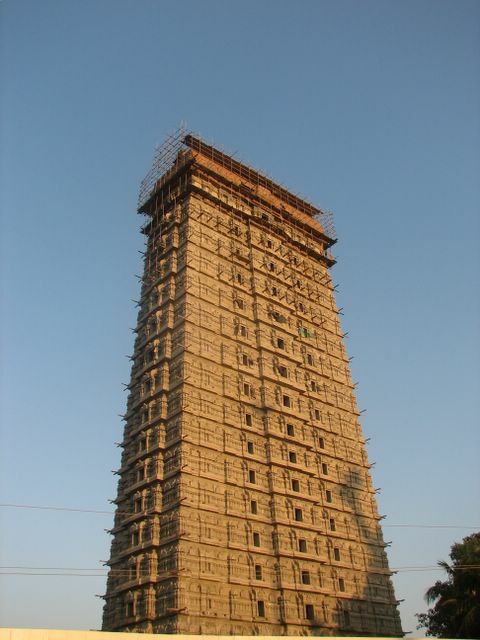 It is bigger than the one at Kempfort Bangalore. 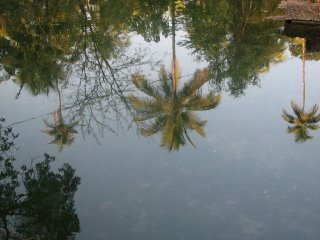 But I some how liked the one in Bangalore. 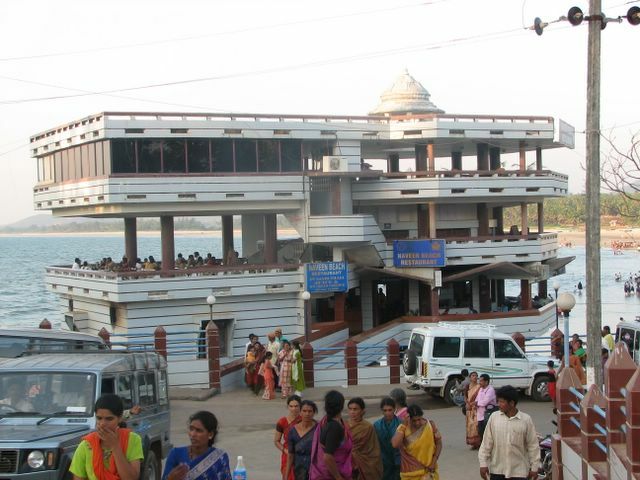 The Restaurant at Murdeshwar, which is partly in the water. It could have been managed better. 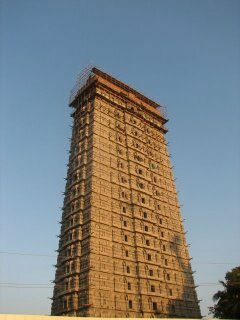 A new Temple under construction. 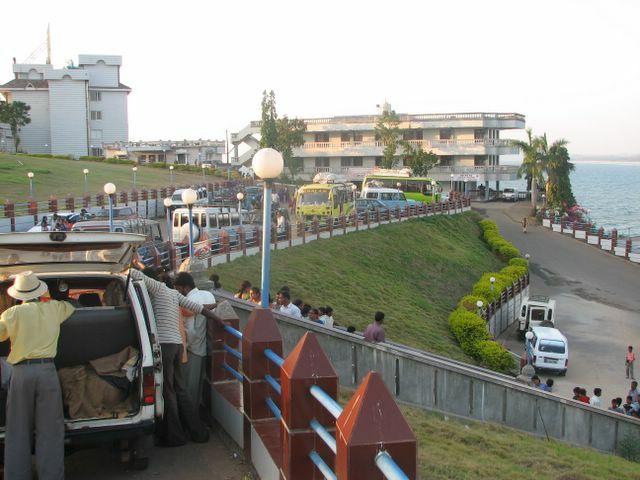 The View of the entire place from the Shankar Statue. 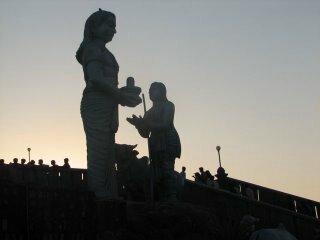 Another Statue out there . Not sure about the details. 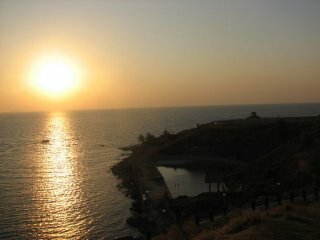 The Beautiful Sunset at Murdeshwar. 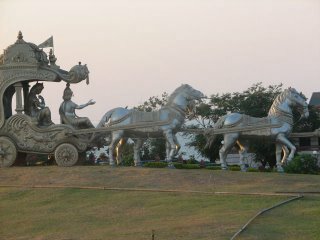 I guess this is Krishna and Arjun on the chariot, Not sure though. A final View of Murdeshwar Temple . Well then at 7 pm we left from there and by 9 we were at Udupi. We lodged at our traditional Durga International, and went to dinner at Kediyoor. I had a nice masala fry Kane and also packed some Ghee Roast chicken.. Well does that bring back some water in your mouth. 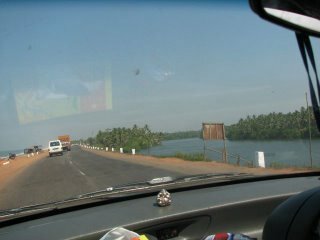 The next day , we started from Udupi at 7 am . Most of the Driving was done by Shweta this time. I think I only drove on the Sakleshpur Ghats. We stopped at all our traditional stops ie first at Kamat Upchar before the Ghats. There we also filled in Gas. And then later at the one after Hassan. It was a nice an thankfully eventless journey. We reached home just after noon. Well thats where our vacation got over. Check for the photographs here. Good on you mate!! Felt really nostalgic reading the blog. Well its not even month since i am back from home trip. but then your blog reminded wonderful moments of home, childhood & the coastal queen. Wish you luck with your new job . Enjoy , have fun keep posting !! Hey nice peice of writng there. And photos to match. 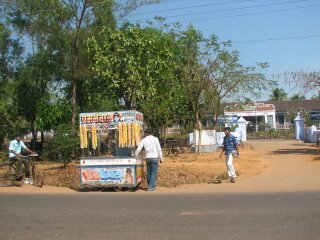 Next time I'm in Goa, I hope to visit the icecram parlor in the Innova. Anup, are u listening? Awesome write up. Made me all nostalgic with our bike trips to Goa and the midnight rides to all the places in and around Manipal.